Above is shown a carved HDU sign for the the Lawrence Welk Resort north of San Diego. We made over 30 outdoor building and wayfinding signs for this famous resort. This rustic signs were hand-carved in the shape of rocks, with raised text. and a sandstone texture sandblasted background . The sign is hand-painted and then clear-coated twice. This signs have two steel posts imbedded in them which are have flat steel flanges at the bottom, which fastened to concrete bases with studs inserted and epoxied n drilled holes in the concrete base. 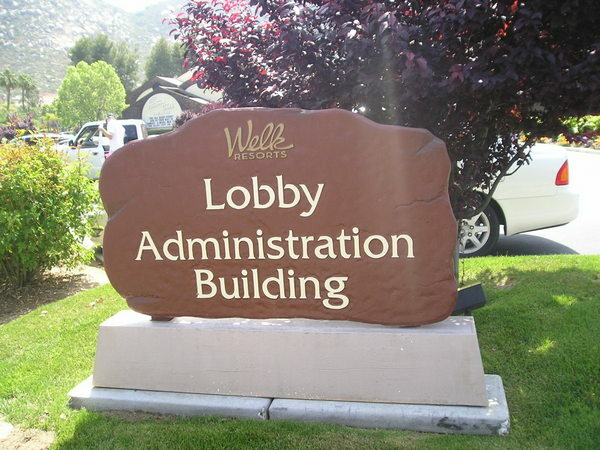 To see premium 3-D or 2.5-D carved, sandblasted, or engraved, High-Density-Urethane (HDU) or wood signs, and EPS dimensional monument signs for hotel, motels, inns, and B&B's in Gallery 29, , please click o,n "Return to List" below right.